For nearly fifty years Moody Library has been a place to gather, study, explore new ideas and make new connections for Baylor students from every discipline and department. 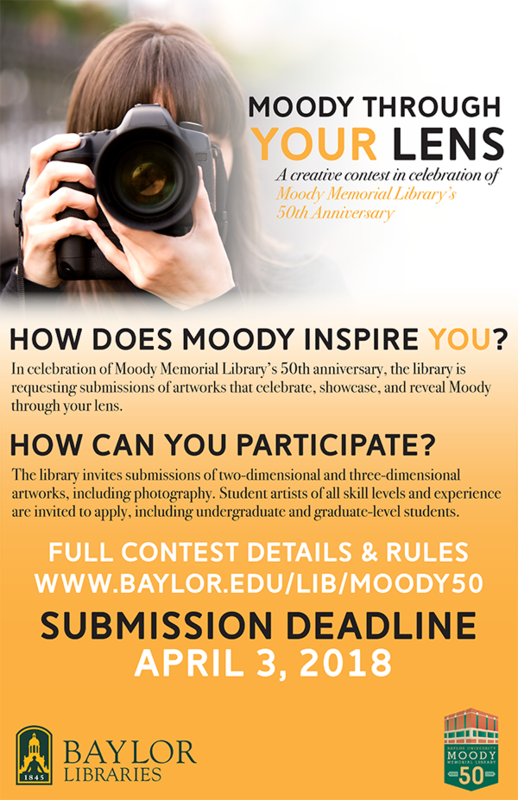 In celebration of Moody Memorial Library’s 50th anniversary, the library is requesting submission of artworks that celebrate, showcase, and reveal Moody through your lens. The library invites submissions of two-dimensional and three-dimensional artworks, including photography. Student artists of all skill levels and experience are invited to apply, including undergraduate and graduate-level students. A group exhibition of submitted works will be held in an online exhibit through Summer 2018. The top three submissions will have their work displayed in the Moody Memorial library for the 2018 Fall semester. Winners will also receive a gift from the Baylor University Bookstore. Images should be in JPEG format and compatible with PC. We may ask you for higher resolution images once your submission has been accepted. We are also accepting submissions of video and/or performance art. Please provide a link to video submissions instead of a(n) image file(s). Please contact us if you have questions regarding your submission. Name your files with your last name and title (or shortened title) of your work, separated by underscores. For multiple images, include a sequential number at the end of the filename. Artworks must be the work of a Baylor student or students. Students working collaboratively are also encouraged to submit. By submitting a work for consideration, entrants agree to allow the University Libraries to display the work for the duration of the exhibit and to publish images of the work online. Inclusion and display of any work in the online exhibit is at the discretion of the committee. All artists who submit work for consideration will be notified of the jury decision by April 17, 2018.